Himalayan Yoga Retreats, Ladakh India. Rejuvenate, Energise and Celebrate your Mountain Spirit. We have 3 retreats, Yoga & Hiking, Yoga & Meditation and Yoga & Cultural immersion, check out more information on this page and get inspired! 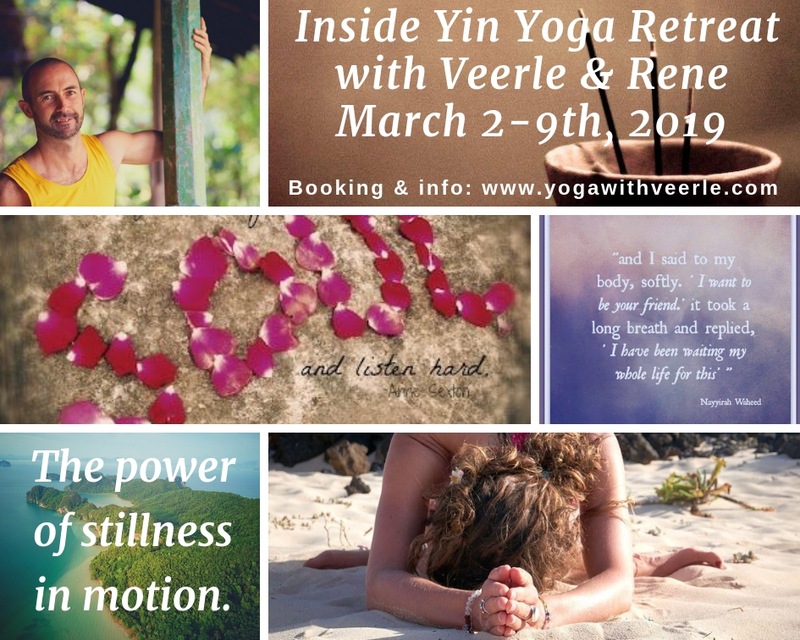 Testimonials from last year’s Yin Yoga Retreat and watch here why our Inside Yin Yoga Retreat will be such a beautiful and powerful gift for yourself! I learned so much. About the Buddhism and all of the monastery’s we saw. About life in the monastery’s and about the different buddha’s, like the Buddha of Compassion, Avalokiteshevara. But also about life in Leh and the village, how people live, work and the importance of Buddhism in their daily life. I learned a lot about the use of mantra’s and the meaning of them. I will never forget OM MANI PADME HUM. I learned also a lot about myself. I really tuned in to myself again and refound the stillness and peace that was right there in my deepest self. I felt what yin and restorative yoga can do for my body and mind. I found the space to connect with myself through the meditations we did and I feel like I opened up so much. Now I can see much more clear again what life is about for me. It’s not about all the stuff, money or goals we need to reach, but it’s about love and compassion and taking care of ourselves, so that we can take care of others around us. I took a lot of gifts with me from this retreat. All the things I learned and the inspiration I got to take with me in my own yoga and meditation practice. My interest in the Tibetan Buddhism and the mantra’s, which I can apply in my daily life. But also the contacts I made with the people of the retreat, the local people and you. The experience of being in such a special place, feeling so energized and opened again. I will never forget this journey in the holy mountains. I loved every aspect of the retreat and that I’m so grateful for you, Veerle and Rene, to show me these great places and shared your knowledge about Buddhism, the people, yoga and meditation with me. I still feel so filled with all the things that I learned from you. The yoga classes of Veerle really opened my heart again. They made me look close to and inside myself again and brought me to my inner peace of silence and compassion. I felt so good during these days of two classes a day and the free time in the garden or the silent valley. I felt so much good positive energy that I didn’t feel before for a long time. I also loved the mantra’s we learned, especially the Om Mani Padme Hum, that I use now every day! The meditations and yin yoga classes of Rene really gave me the time and space to surrender to the moment. To really be in the moment with just the focus on the breath. Our morning session on the Shanti Stupa was a really nice experience! Such a special place to do a yoga and meditation session, you could really feel the energy of this special place. Also the morning prayers we attended at Thikse Monastery were so impressive to me. It was such a special experience to see and hear the monks doing their daily morning ritual. I could watch and listen all day. The contact I had with the local people was so nice! All the people I met were super gentle and happy people. I was quite impressed by the beautiful Ladakh area, the nature was overwhelming, spiritual with the mountains and monasteries. What a lovely welcome in the hotel Togacheepa and village – a very comfy hotel and amazing yoga studio, nice staff, secret garden and great yoga studio. The energy, compassion and dedication of Veerle and Rene is touching, they make all the difference. Yoga classes from Veerle are high-level, practically but also spiritual and she has such a lovely (singing) voice. An experience to keep in my heart! Island Yoga goes Himalayan in August 2018!!! We are so excited and proud to announce that Island Yoga is expanding her horizons with us into the Himalayas! Next August, from the 27th till September 5th 2018, we will take you up to Ladakh, "The land of the High Passes" for a 10 day yoga & meditation retreat, combined with a Buddhist cultural tour and luxurious Eco stay in a small and traditional village nested in the heart of the Himalayas. Himalayan Yoga Retreat, Ladakh, 28th of July till 4rd of August 2017! Himalayan Yoga Retreat, A true spiritual experience in “The Land of the High Passes”. 8 days of yoga, meditation, pranayama, mantra’s and Tibetan Buddhism practices in the beauty of the Himalayas. A pilgrimage to purify both body and mind and re-align with your spirit, inner strength and wisdom. Have you always dreamed about wandering over the snowcapped Himalayas? Are you looking for an authentic yoga retreat with high experienced yoga teachers, in one of the most spiritual places in the world? Do you love to get inspired by the mystery of nature and breathtaking mountain views, ancient Buddhist monasteries where monks have been meditating for 1000’s of years, the sound of Tibetan mantra’s and prayer flags whispering their secrets over the highest passes of the world? Do you love to deepen your connection between body, mind and soul, and find more balance, harmony, strength, silence and peace within yourself? Do you feel it’s time to expand your inner and outer horizons? If the answer is yes, then this Himalayan Yoga Retreat is what you are looking for! Experience North India’s ancient name “The land of Gods” and breath in the majesty and peace of the stunning snow-capped mountains. Wake up with the sun rising up over the snowcapped mountains and the sound of yak bells in the air. Meditate within the extraordinary sights of the majestic mountains and feel the vibrations of the ancient monasteries. Inhale the crisp mountain air and absorb the beauty of the mountain peaks as you step on your yoga mat in the morning on the rooftop. Take time for yourself to reflect, enjoy silence or explore the local village and harvest time. Get welcomed by the friendly Ladakhi’s and invited into their traditional houses, or take the opportunity to join them on the land to experience the traditional summer harvest of apricots and barley. We have on purpose chosen for an 8 days retreat as reference to the Eight-Folded Path, the foundation of the Buddhist teachings. An inner journey to embody your own inner Noble Truths, and re-connect with your seat of joy, wisdom, peace, happiness, compassion and empowerment. 8 days to lose yourself in the beauty of the Himalayas, to take time for yourself and feel balanced, grounded, relaxed, sustained and rejuvenate. 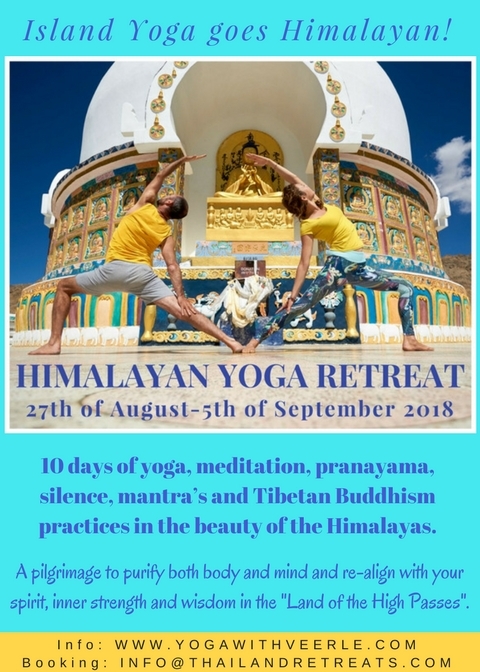 This Yoga retreat includes the exploration of the traditional buddhist cultural heritage of Ladakh and its ancient monasteries, authentic, high quality and ecological accommodation in a remote farmers village, daily dynamic morning yoga classes, meditation, pranayama, workshops, yin and restorative yoga during the evening, kirtan and Tibetan mantra’s under the stars. "The mountains are calling and I must go! " 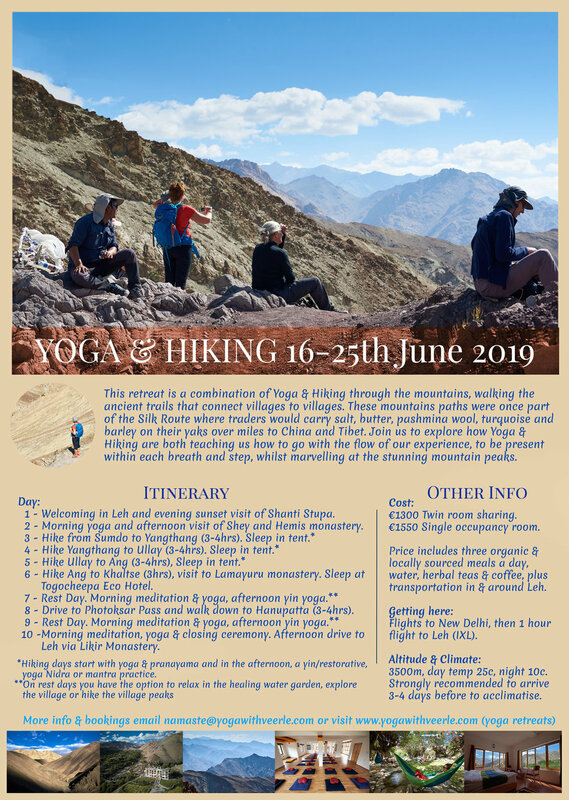 If reading about our Himalayan Yoga Retreat excites your spirit, and you hear the call of the mountains, then go to the contact page and connect with us for more information or registration! We are looking forward to welcome you in the beauty of the Himalaya's and have us joining this unforgettable experience! If you need an escape of your busy daily life, if your soul longs for a change and spend time on a beautiful beach on a magical Island. If you want to practice yoga, chill out, relax and eat delicious Thai food. If you feel like exploring and connecting with nature, the ocean and remote Islands, then you are reading this for a reason and most welcome to join me for a Yoga Retreat at Island Yoga on Koh Yai Noi! I will be teaching at Island Yoga Retreats from the 1st of February till the end of April 2017! Island Yoga retreat is located on a small and isolated island between Koh Lanta and Phuket in South Thailand. Island Yoga hosts vacation retreats that are suitable for all levels of students; from beginner Yogis to advanced practitioners. You can tailor your retreat according your time and needs and start a 3, 5 & 7 night programs at any time! Start your day with the rising of the sun and join for Tai Chi on the beach, followed by a led meditation and dynamic morning yoga class. After a healthy breakfast there is plenty of free time and many options to join yogi adventure outings, afternoon yoga workshops, swim, read, relax and experience our evening family dinners and yogic movie nights! The retreats allows you plenty of time to relax and reconnect with yourself and to explore this magical island. Our programs are fun and inspiring and will nourish your body, mind and soul. It’s an opportunity to open your heart and move towards a more conscious and empowered life, and start listening to who you really are and what you want in life! Island Yoga retreats are also ideal for meeting like-minded people and making new friends, coming together to find new inspiration and to share exciting new adventures. The retreats appeal equally to the dedicated yogi, the nature lover and those looking for a relaxing vacation retreat. Brighton Girl Magazine covering my Roll & Release workshop!! Paying attention to the aches and pains of our bodies day-to-day is a vital first-step in performing self-care. By listening to our bodies, we are able to remedy any issues it highlights for us. Lizzie, one of our Brighton Girls, was invited to pick up some new techniques and exercises to include in her own routine by attending the new Roll & Release workshop instructed by Veerle Geuens at The Float Spa. Fascia has only been properly researched in the last twenty years, with the research highlighting the fascia’s great importance when looking at the body’s anatomy. Fascia is the connective tissue in the body that covers muscle, bone, nerves and so on from head to toe as one continuous structure. It has an appearance similar to a spider’s web and can be greatly influenced by our mood and physical activity. As related to these, it can become stiff and cause pain and/or density in the affected areas. By keeping our fascia happy and healthy throughout our body, however, it is possible to relieve these tensions and enable the body to move freely as it should. The techniques themselves are simple and can involve tools such as rollers, myofascial balls, blocks or tennis balls. In this workshop, Veerle taught how to slowly and gently roll different parts of the body using a block and/or tennis balls, targeting tougher spots for longer where possible. We worked from our toes all the way to the nape of the neck, always breathing in through our nose and out through our mouth as we worked on each body part, incorporating asanas in between to stretch and ease the areas being worked on. Something I realised midway through the workshop was that as I rolled the top part of my left leg from side to side on the edge of my block, I hadn’t anticipated hitting such a tense ‘spicy spot’, as Veerle calls it. As a yogini and gym-goer, it shouldn’t have been a surprise. Focusing attention on these particular areas were tough, but the floaty feeling felt by the end of the workshop was like having a suit of armour lifted from my body. I discovered so many ways to use one or two tennis balls on different parts of the body – including the glutes, the chest and the nape. Applying gentle pressure on these areas is very satisfying. Top tip: keep some tennis balls under your office desk to massage your feet – a body part we easily ignore but really shouldn’t! The workshop introduced me to the importance of fascia, with the techniques helping me understand my body much better. I left The Float Spa feeling totally and utterly relaxed. Now, I’m off to buy some tennis balls to keep under my office desk. Thanks Veerle! Veerle’s next workshop at The Float Spa will be the Autumn Restore and Renew Yoga Workshop on 13th November. To find out more about this workshop, Roll & Release or any other workshops/classes that Veerle Geuens teaches, please visit her website: www.namoyoga.be. Lizzie is a Digital Marketer who also writes a lifestyle blog, check it out at www.pereyrey.com. Follow her on Twitter @pereyrey. In autumn we learn more about ourselves, perhaps, than in any other season. Autumn marks the end of the growing season, the abundance of the sun and summer energy. A turning inward, a falling away of outer-directed energy. Leaves turn color and drop. Autumn teaches us about our own cycles of creating and letting go, and restoring our energy for the winter to come. The energy of autumn, is related to the vata dosha in Ayurveda or metal element in Traditional Chinese Medicine, representing the importance of slowing down, grounding and connecting with the earth and its rhythm, turning inwards and letting go of the waste, the old and stale in our lives. Silence is ultimately something that comes from the heart, not from any set of conditions outside of us. the inner realm of our lives that can bring more comfort, nourishment and balance. What to expect: This Restore and Renew workshop is a call to push your ‘Pause Button” and retreat in yourself. To find inner silence and re-connect with that sacred and healing place inside yourself and the natural cycles of life. Through the art of pranayama’s, restorative and healing yoga practices we release the unnecessary and tensions of daily life. Nowadays many of us thrive on time pressure and are addicted to high levels of cortisol in our bodies, leaving our nervous system overcharged. In the long term this will leaves our vital energy depleted. When we allow ourselves to surrender in stillness, our bodies and mind start to recharge, relax, heal and rejuvenate our subtle and energy body. This workshop will boost your immunity system and vitality for the winter season, while deeply relaxing your mind and nervous system. Date and price: Sunday 13th of November, 2-4pm. £20 in advance, £25 at the door. Roll and Release workshop at the Float Spa, 8th of October. Why let stress bind us when simply we can move this overcharged energy? This workshop is a journey into deeper waters of healing through roll and release. Roll and release yoga is a pathway to healing, flexibility, letting go of tensions and pains and even letting go of emotional energy that causes a lot of suffering. We use ‘props’ like tennis balls and blocks to massage and manipulate the myofascial tissue, which is a membrane that holds our energy and emotional body. The fascia is a fibrous connective tissue that is present throughout our entire body, not just the muscles. It’s through this connective tissue that energy flows and stress and tensions can create blockages and stiffness. Often through emotional traumas, physical injuries, overuse of muscles, lack of movement and just daily life stress, this membrane can hold tensions and block our vital energy. Roll and release is a form of self-massage with the capacity of resetting our emotional and physical body and release stress related patterns. What to expect: In this workshop you will learn what fascia is and how it gets affected by physical and emotional stress. You will learn how to liberate yourself from tensions created, improve the mobility of the joints and your flexibility in general. Through breathing exercises and gentle asana’s you will experience a deep relaxed state of mind, as the nervous system will start to unwind completely. A welcome gift of tools to take home to release tensions in your body at any time you want! Veerle is a 500hrs accredited yoga teacher, specialised in vinyasa, yin and restorative yoga. With 10 years of yoga practice and yoga teacher trainings in India, Bali, Thailand, Switzerland, Belgium and UK, Veerle has a profound knowledge in teaching yoga and tailoring classes to the students specific needs. Veerle has a background in Clinical Psychology and has studied Traditional Chinese Medicine, Buddhism, Ayurveda, Mindfulness as well as Yoga Therapy for stress, burn out and chronic fatigue. Namo Kids Yoga at Unity studio! Why should kids do yoga? As parents, you may be able to pick many activities for your children. How do you choose what is best? What should be a priority? How do you make sure they have a balance between fun and other beneficial experiences, maybe even those with long-term benefits? Fortunately, there’s yoga for your kids! It’s fun, it’s active and it’s calming – while subtly infusing a sense of self-worth. Through the physical practice, yoga nurtures flexibility and freedom of movement and grows corresponding self-confidence. Yoga gives kids healthy bodies and minds and develops their radiant little selves. So, what goes on in a kids’ yoga class? First, yoga gives children a chance to explore being in their bodies and discover the spectrum of amazing things we can do... stretch, jump, be quiet/loud, balance, twist, bend, rest, be alone and in a group, focus, get strong and flexible, sing, play and be upside down. Yoga is one of the best activities for kids. A child can come into the class tired, frustrated, hot, hyperactive and – wherever they are – yoga practice begins. Second, yoga is non-competitive. Unlike sports, learning an instrument, or playing video games, yoga does not encourage competition; nor does it put pressure on children to do more, do better, or go faster. During yoga, kids notice how their own bodies move. It’s fun as they try different poses, developing self-awareness and recognition of the their strengths and where they can improve – without self-judgment or comparison. Yoga is one of the best ways to build children’s confidence. Finally, yoga gives children a chance to be mindful, get perspective and rest. All of us, all the time, in our busy lives in the modern world are over-stimulated. Stress – noise, crowds, carrying heavy bags, working on computers, being in cars, having to rush to get places, all tax our nervous systems. Kids are not different! So, in class, after your daughter or son practices poses, laughs and discovers new things about their bodies, there is relaxation. A time of lying down gives an experience of goodness and relief of quiet restfulness, stimulating the calming parasympathetic nervous system. It teaches children the value of quietly breathing and to focus on what is going on with them versus what the world asks them to focus on. Believe it or not – kids, even super-active ones, love this! What should you tell your children about yoga? That class starts with sitting in a circle, maybe a name game, listening to a bell, breathing or singing, then we’ll do stretches and poses to warm-up, a series of poses around a theme (like rainforest, circus, strength and courage). At the end is a nice relaxation. Brighton Yoga Festival, 23rd of July 2016! A day of FREE yoga classes, workshops, treatments, demonstrations, nutritionists, lectures, meditation classes...delicious food, yoga markets, live music! The festival will be held at the Brighton Dome and welcomes everyone, as our aim is to make yoga accessible for everyone and celebrate the love for yoga! A day to connect with ourselves and other yogi's, from the absolute beginner to the more advanced yoga practitioners! YOU ARE INVITED TO JOIN IN OUR 108 SUN SALUTATIONS ( a simple sequence of 12 postures ) you can do one salutation or as many as you like. The salutations will be lead by Veerle and Amasu members of the Brighton Yoga Festival Team, volunteering yoga teachers, all for the love of yoga. Yoga Workshop: Transform your life into the life of your dreams!! After two months of traveling, training and teaching yoga in Bali and Thailand, I want to give something back of what I have learned on this journey. Life is about taking the risk to find happiness by following your dreams and transform your life into the life you dream of! This 2hrs workshop is about become more of who you truly are, develop the power and strenght to follow and live your dreams! Be brave to be quiet enough to listen to the voice of your heart to hear which is the path you want to start following. Be prepared to tap into your personal power, to be passionate and open for new possibilities that might arise during these 2hr workshop!!! Lots of fun, some new funky armbalances and up-side down poses garantueed! Where: Thomas More, Kronenburgerstraat, Antwerpen. Small room, NOT in the BASEMENT GROUP SPACE!!! Who: anyone who wants to take his/her practice a little deeper and start living according your dreams! No Sportsticker or UA Plus Pas required! Although this workshop will give you the option to challenge yourself for some more advanced poses, this is optional and the workshop is open for everyone with a basic experience in yoga. The biggest challenge is showing up on your mat!!! Entrance: 6.5 euros for students/8.5 euros for non-students. De lente is de tijd van nieuwe energie. Het ritme van de natuur verandert en het voorjaar is het ideale moment om hernieuwde energie op te doen en afvalstoffen af te voeren en uit onze winterslaap of voorjaarsmoeiheid te ontwaken. De donkere maanden van de winter in combinatie met onze “fast-forward” maatschappij tasten vaak onze energiereserves aan en in deze workshop leer je hoe je deze weer gemakkelijk en effectief kan aanvullen. Deze 'Release-Rest-Relax-Restore-Renew' workshop staat in het teken van even de “pauze-knop” in te drukken en de lente energie volop aan te vullen: moetens, spanning, blokkades en stress los te laten en terug verbinding te maken met je innerlijk kompas. Ervaar het ontspannen gevoel van yoga, ontgift en adem meer vitaliteit door middel van pranayama’s, bouw je vitaliteit weer op door je dagelijkse routines en voedingspatroon aan te passen en ontdek hoe je eenvoudig je gezondheid een boost kan geven! De verhalen van Clarissa Pinkola Estes inspireren wereldwijd vrouwen om zich opnieuw te verbinden met de krachtige natuur van de ontembare vrouw. Een heel weekend vol yoga, verhalencirkels, muziek, creatieve workshops geinspireerd door vrouwenverhalen die je uitnodigen te zijn, voelen, verbinden, te verlangen, creatief en Vrouw te zijn. Kruip in je wolvenhuid en laat je een heel weekend verrassen en onderdompelen in de natuur van de Ontembare Vrouw. Wees welkom!